Today, we bought my socks for tomorrow. 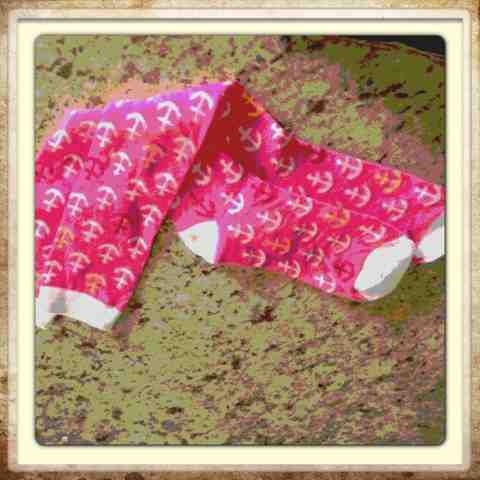 I think they're perfect since we need the embabies to play like anchors and stick! Plus, we bought "The Cat In the Hat". One of my IVF friends, Michelle (the one that gave me free meds), said it's a superstition she used. I'm supposed to read it tonight. Plus, we bought pineapple with core. I have to eat it for five days starting tomorrow. Also, something Michelle said worked for her. I'm starting to feel considerably better today, but I feel really bruised at the Progesterone injection sites. I can feel the bruises all the time! We are at my parents' house waiting out some tornado warnings right now. They have a storm shelter. Lots of prayers tonight for our embabies, a thick and sticky uterus, and the culmination of these tornadoes! You got em, Laura and Todd. The prayers, that is, and lots of positive thoughts today.